In addition to staying inside where it's warm during the really cold weather, there are other precautions you can take to keep your kids safe this winter season. 1. Choose appropriate clothing and footwear. Clothing and footwear that is too tight can restrict movement and blood flow, which can actually make your kids feel colder. Opt for wind and waterproof layers and head, neck, face and hand protection to keep your kids dry and warm. When choosing footwear, select appropriate sized winter boots that have good traction. 2. Remember the snow reflects the sun's ultraviolet rays, so be sure to use sunscreen and have the kids wear sunglasses when playing outdoors. Even on cloudy winter days, the sun can still cause damage. 3. Be prepared for bad weather. Stock your home and car with extra dry hats, mittens and socks. Be sure your vehicle is loaded with emergency supplies like a shovel, blanket and flashlight and refresh your first-aid kits in your home and car. Keep a few nonperishable food items on hand should you lose power during a storm. 4. Play safe. When sledding, snowboarding, skiing or ice skating, be sure your children always wear a helmet and other appropriate protective gear. 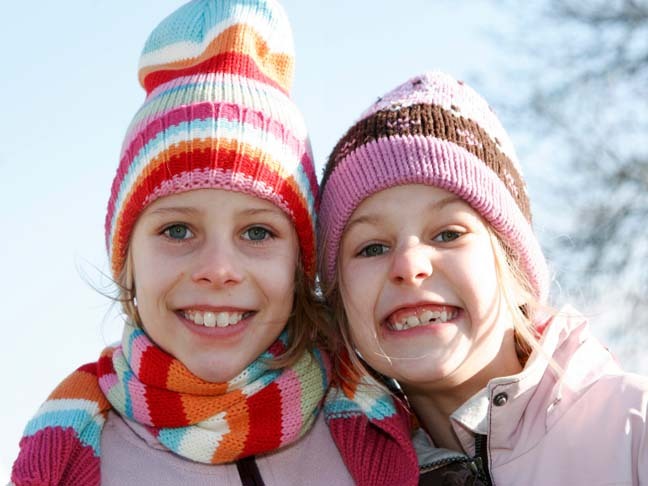 Be sure your children only use proper age and size appropriate equipment and only skate on outdoor frozen lakes and ponds that have been inspected and authorized for skating. 5. Heat your home safely. Before the cold weather sets in, be sure your home heating equipment and smoke and carbon monoxide detectors are working properly. Avoid using space heaters and your oven for home heating, which can pose a risk for fire and injury. When using a fireplace, use extreme caution and protective barriers to ensure your children's safety. Always teach your children about fire safety and the importance of staying away from heat sources in the home. The winter months provide wonderful opportunities to visit friends and family, play outdoors and enjoy a toasty fire. These things can all be done a bit safer with a little planning and preparation.